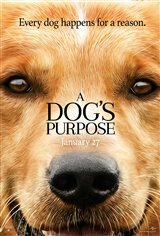 A devoted dog (voiced by Josh Gad) goes on a quest to discover his purpose in life over the course of several reincarnations and the many owners to whom he belonged. Along the way, he ponders such existential questions as "Why does food taste better in the trash?" and "What is the meaning of life?"